"DESIRE" is a professional vocal group specializing in the OLDIES from the 50's and 60's, with a strong "group harmony" sound. 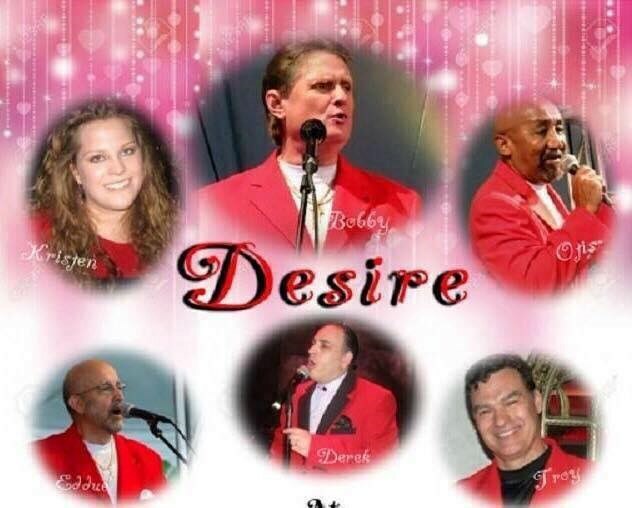 Several members of "DESIRE" have performed together for over 35 years as part of other oldies groups including "THE PARAMOUNTS", "MEMORY" and "HARBORSIDE". In 1981, Desire recorded for AVE. D records with "MEMORY". "DESIRE" has opened for JAY LENO and has performed with many major acts such as THE HARPTONES, THE DUPREES, THE PLATTERS, THE COASTERS, THE DRIFTERS, THE DUBS, ARLENE SMITH of THE CHANTELS, THE CAPRIS, JOHNNY MAESTRO & THE BROOKLYN BRIDGE, THE EARLS and many others. Desire is recognized as the most fan friendly and accessible group on the East Coast and, as a result, has a large dedicated following. Desire's FAN CLUB is located in Rockaway, NJ. The fan club's President, Marilyn Serra, can be contacted through the ROCKAWAY TOWNSQUARE SINGLES GROUP and through our web page. Our entertainment manager is Bobby Hepburn. He is also a performer and can be contacted using our DESIRE email address or directly by phone. We sing with either tracks or a band, depending on the size and budget of your event. We also perform songs in acappella and will tailor the music choices to your special event. We do weddings, private parties, charity events, outdoor summer concerts, restaurants, club dates, dinner parties, reunions and any social event. We can also offer DJ services during the evening, so we can cover the full spectrum of music for any age group and offer continuous music. "DESIRE" will always present a clean, professional image at your event, and will be suitably dressed for the occasion. Every performance is important to us and we will be happy to tailor your music choices and guest interaction to your specific needs. 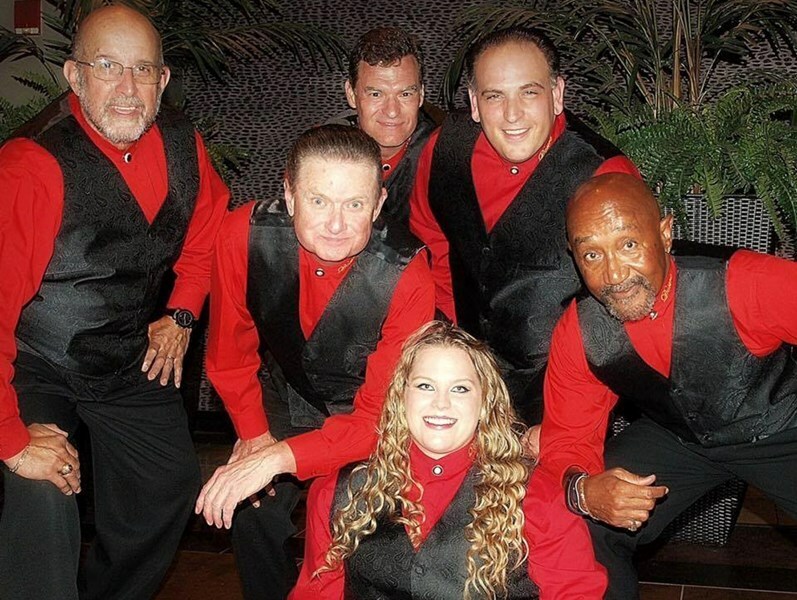 We are recognized as one of the TOP vocal harmony groups in the East Coast, specializing in the DOO WOP and Oldies sound. Desire recently opened for Jay Leno at the Sands Casino & Resort in Bethlehem, PA. We appear on a regular basis at numerous New Jersey, New York and Pennsylvania venues including: Caesar's in Atlantic City, NJ, The Lake Naomi Country Club in Pocono Pines, PA, The Sands Casino in Bethlehem, PA. Junction 46 in Ledgewood NJ, and Gaetano's in Bath, PA. We perform at the world famous MUSIKFEST in Bethlehem Pa. every summer. 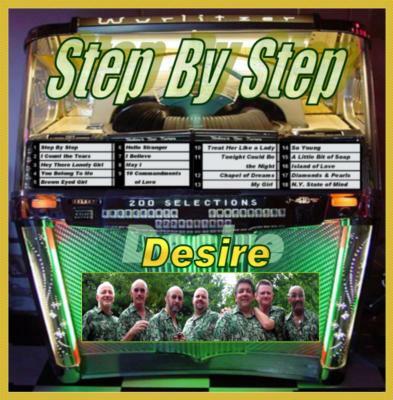 Our debut CD, "STEP BY STEP" was released in November of 2008. We enjoy what we do and we look forward to performing songs from the 'Soundtrack of Your Life'. Thank you Robin. You have a wonderful loving family and it was our pleasure to perform for you! Hopefully, we'll see you again in the future. Bobby & "DESIRE"
DESIRE played our parents 50th anniversary party. They were fantastic. They were so easy to coordinate with and couldn't have been more accommodating. I would highly recommend for any event! Superb presentation. Excellent rapport with hosts and guests. We hired Desire for my father's 70th birthday party as he is a huge doo wop fan. We were beyond happy with their performance, professionalism and talent. We had an outdoor party for about 60 people and had the worst rain possible!! We made due with a tent and heaters but the space was much smaller than we anticipated. It was no problem for the band and they didn't bat an eye at the unexpected challenge. Everyone had an amazing time....danced and sang along all night. I would highly recommend Desire and would book them again in a heart beat. Thank you so much for an unforgettable night!!! In one word, "AWESOME!" The entire group was friendly, professional and worked the crowd to perfection. If you are looking for an oldies group, this is the band for you. DESIRE was awesome! They turned a 60th Birthday party into a bash. Desire is a such a talented group and I am shocked on how reasonable there rate is compared to there talent. I can't thank them enough for providing my guests with such great entertainment, everybody was overwhelmed with there music. I will definately be booking them again and highly recommend Desire. Please note DESIRE will also travel to Palmer, Bethlehem, Tatamy, Nazareth, Phillipsburg, Stockertown, Lehigh Valley, Bath, Durham, Martins Creek, Hellertown, Riegelsville, Springtown, Bloomsbury, Kintnersville, Stewartsville, Allentown, Catasauqua, Milford, Ferndale, Wind Gap, Ackermanville, Coplay, Flicksville, Neffs, Northampton, Pen Argyl, Revere, Whitehall, Bangor.